Today I caught one of my targeted students writing independently. For many you may think this is not that great at all. However the background to this had me jumping for joy. 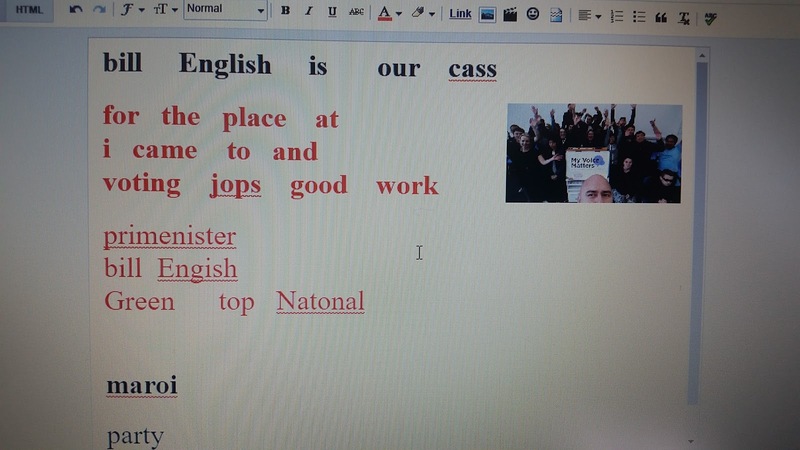 We had just a had a speaker from Enroll to vote NZ speak to my learners. There was lots of time for questions and roll plays of what was coming up in the general election. This student was quiet and non-engaged for the majority of the session. Some students asked if they could blog about the experience so they could email the presenter. The picture you can see was published in the Howick Times. Fast forward a couple of weeks and when i asked to students to create a blog post about a basketball event to had just been to, this student finds the photo of the voting and then proceeds to write down all the important facts he could remember. This student has a huge struggle with writing and sometimes will stay home if he knows we will be writing that day. But for me to see this showed me that the work that we have been doing around being a confident writer, and not worrying about making mistakes or being wrong was awesome.